The Arts Council of New Orleans, on behalf of the City of New Orleans’ Percent For Art Program, is pleased to announce the completion of a new sculpture created specifically for Coliseum Square. 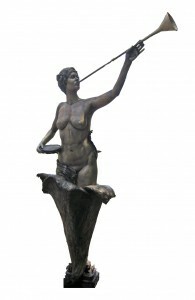 The sculpture, Birth of a Muse, by local artist Kim Bernadas, was selected by a panel of neighborhood representatives, an artist, architect, landscape designer and public art expert. The location for piece, at the corner of Prytania and Terpsichore, was determined through neighborhood surveys with the help of Coliseum Square Association. When the piece is installed on Terpsichore St. it will create another entrance point to the park guarded by a strong female figure; like Margaret Haughery at the Clio St. entrance, and Sophie Wright at the uptown end of the park system. The sculpture budget of $30,000 was allocated in 2004 through City of New Orleans capital bond sales associated with the renovation of Parks and Parkways in the Lower Garden District area. Since Hurricane Katrina, the Percent For Art Program has prioritized the restoration of public art throughout the City, but is extremely pleased to change focus back to commissioning new work with the Birth of a Muse harking the new New Orleans. Please join the Arts Council during Arts Week on Friday Sept. 23rd from 5:30-7:30 for the unveiling ceremony and reception featuring live dancers and musicians, refreshments and hor d’oeuvres. Following the event, stick around Coliseum Square for a free outdoor movie night with the New Orleans Film Society – Ghostbusters starts at 8:15!